Rickie Roo, well-known star in the world of dog agility is also known for her canine philanthropy, recognized by the American Kennel Club as an Award of Canine Excellence (ACE) award honoree for her educational and charitable efforts. 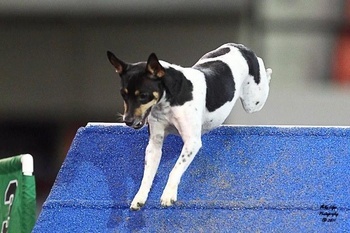 This spunky 7-year-old Rat Terrier is an exceptional athlete and is ranked among the best in her sport, earning her titles Master Agility Excellent and Master Excellent Jumpers With Weaves. These titles were needed for Rickie Roo to qualify for this year’s Westminster Kennel Club Dog Show Masters Agility Challenge event. Despite having a visual impairment due to both lenses needing removal because of primary lens luxation (PLL), she will be competing on February 14th (show airs on 2/15) at Westminster. In the sport of dog agility, just like in the Olympics it is important to be in tip-top shape and able to perform at your best. Which is why her breeder, Barbie Trammel and her owner and trainer, Deborah Davidson-Harpur had Roo’s DNA tested for an inherited mutation that causes lens dislocation in several breeds. PLL is caused by a mutation that affects the ligaments that holds the lens of the eye in place. When those ligaments fail, the lens dislocates and becomes an emergency situation. Because they learned from the DNA test that Roo was at risk of losing her vision and quite possibly her eyes from this disease a strong relationship was built with her eye specialist. When the day came that a slight sign of trouble occurred, Deborah acted quickly, getting Rickie Roo to her veterinary ophthalmologist at the first signs of trouble and after surgery to remove the lens, saved her eye and her vision. Unfortunately, with this disease, both lenses can dislocate and sadly, the second lens dislocated within weeks of Roo having surgery to remove the first lens. Rickie Roo may be a little dog with a disability, but she has a big heart and lives to do agility. She has her veterinarian’s permission to compete and although she is far-sighted and has no depth perception, she has her vision, and what her owner calls “a great RAT-ITUDE” and thanks to the knowledge her owner got from genetic testing, is ready to compete with the top dogs in agility at this year’s Westminster Kennel Club Masters Agility Challenge. Paw Print Genetics is proud to support Rickie Roo at this year’s Westminster dog show to help spread the word about inherited diseases, to support dogs with disabilities and promote responsible dog ownership. You can read more about Rickie Roo’s challenges with PLL and her journey back to the agility circuit in the Paw Print Genetics blog. Photo courtesy of Deborah Davidson Harpur and Rickie Roo, used with permission from Mike Lifer. Rickie Room is amazing, as is her relationship with Deborah. Nothing deters Roo's attention from Deb, whether training or hanging out. Go Roo! Good luck at Westminster.